What Are Dominant Seventh Arpeggios? Dominant seventh arpeggios are made of four tones that are : Root (1), major third (3), fifth (5) and minor seventh (b7). They can be seen as dominant 7 chords whose notes are played one after the other. They are nice devices to create fluid and clear lines over dominant chords. You see in the chart that the G7 chord has the same notes as the G7 arpeggio. It contains a root (1) (G), a major third (3) (B), a perfect fifth (D) (5) and a minor seventh (F) (b7). How to Use a Dominant Seventh Arpeggio? 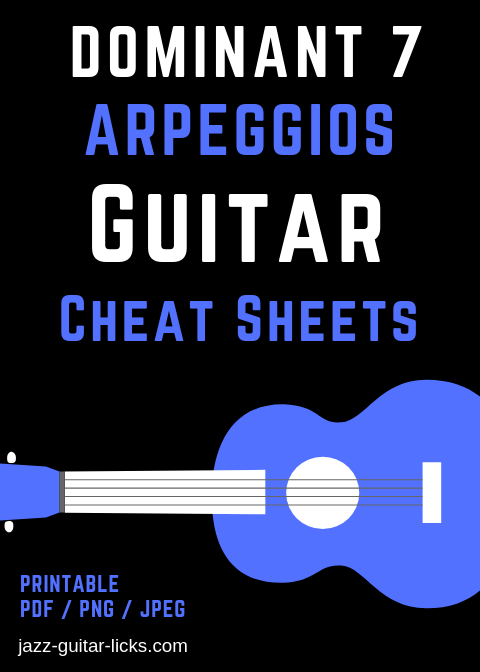 The basic use of an arpeggio is to play it over its corresponding chord. Let's take an example with a C major II-V-I sequence : The chord progression will be Dm7 | G7 | CM7 | % |. That means that we will be playing a D minor 7th arpeggio over the Dm7 chord, a G dominant 7th arpeggio over the G7 chord and a C major seventh arpeggio over the CM7. How To Play Dominant 7 Arpeggios on Guitar? 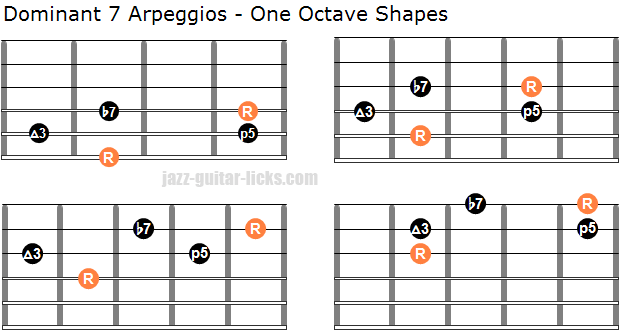 Here are four basic dominant seventh arpeggio patterns. The notes of each shape are spread out over one octave. 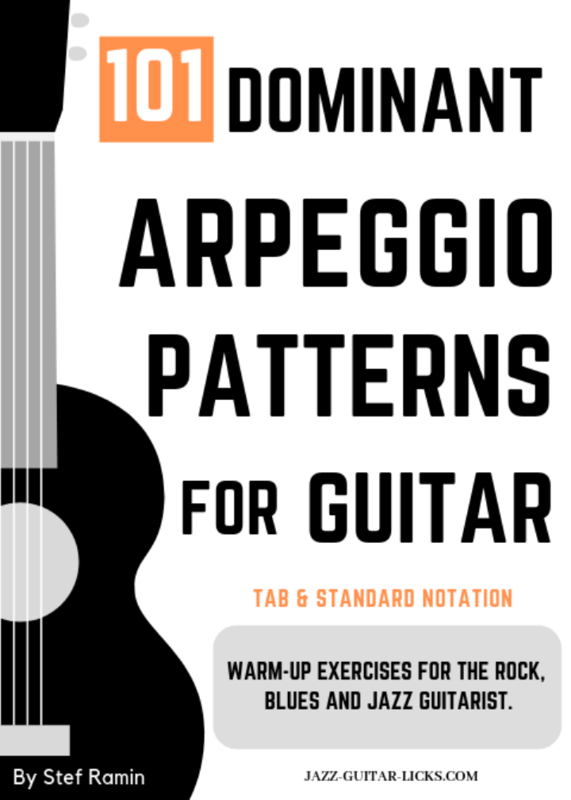 If you play dominant seventh arpeggios for the first time, it is highly recommended to play them by starting on the root (R) in order to hear them correctly. The next two diagrams show how you can play dominant 7 arpeggios in position within the space of two octaves. Once you are comfortable with the one octave shapes previously seen, you can try to play these shapes starting from the third, the fifth and the seventh. Of course, there are many other possibilities of fingerings, try your own. Playing the corresponding chord after or before these arpeggios is a good way to bring them together. Here is a short II | V jazz guitar line using a G dominant 7th arpeggio. Measure 1 : D Dorian mode starting on the root with a passing tone (A#) between the fifth of Dm7 (A) and the major third of G7 (B). Measure 2 : G dominant 7th arpeggio starting on the major third (B) with another passing tone (A#) to approach the major third.